For this reasons we would like to show you how the industry itself has developed over the last years and if Sto has only profited by this development of the industry or if Sto is an outstanding player in the industry of heating insulation. 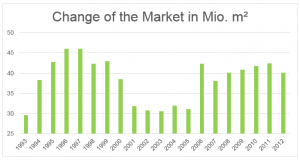 In the following chart you can see the change of the market size of heating insulation in m². You can observe a high volatility in the chart, which is clearly linked to the construction boom of the late 90’s and the years after 2005. We think that this chart is rather meaningless, because of the fact that you only see the m² of installed heating insulation in Germany, but the companies didn’t charge their clients for m², they charge the money for m³ of heating insulation. For this reason we have built another chart with the development of the thickness of the heating insulation. In the next chart you can easily observe that the thickness of the heating insulation has a strong upward trend in terms of average thickness in mm. Whether you then multiply the mm of the year 2004 and the constructed m² you get to see the produced and installed m³ of heating insulation, which was 30.690.000m³. In the year 2012 you can observe an average thickness of 125mm and 40,1 Mio. 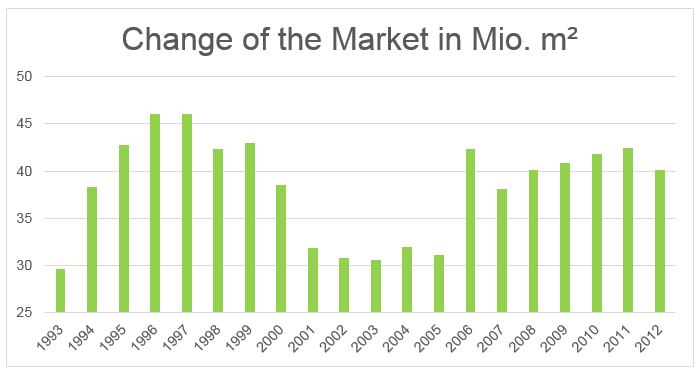 installed m² which leads us to 50.125.000m³, an increase of nearly 60% in only 8 years. For this reason we think that Sto has visibly profited from the trend in heating installations, and the increase in profits over this time is not only linked to the fact that they are a good company. As a conclusion of the moat research we think that Sto is a good company with a medium size moat which is linked to its understanding of the customer and the direct sale approach, but furthermore Sto has profited from a good macro environment. In our last post we have stated that we can see on Sto’s balance sheet that it consists to 2/3 of short term assets and these short term assets consist to more than ½ or roughly 215 Mio. Euro out of cash. An interesting fact is that the amount of cash more than doubled over the last 5 years and we can assume that the company does not need all this cash for its ongoing operations. A further interesting fact is that Sto was able to reduce its debt completely and after that establish a net cash position over the last 10 years. Cash is only of value to an investor if he can get rid of this cash. The question which an investor should ask himself is, what Sto will do with the new money which will be generate over the next years, because they can’t reduce their debt a second time. This is a big question mark in this valuation! Because of the fact that we assume that we will not have any access to the cash pile of Sto, we think that the return on equity is a good estimator for the owners earnings, but it has a clear downward trend over the last years and is now around 14%, (because of the high cash pile). The price target of our cash flow model is around 180€ per share and the Graham formula give us a value of 230 € whereas our model give us a fair value of around 191€ and without any future growth 170€ per share. As a conclusion we can say that Sto is a good company, with a mid-size moat and a fair price of around 180-190 Euro. But we will not invest in Sto, because of the fact that we can’t trust the management and that we will see future actions against the VZ shareholders. Furthermore we have a problem with Styrofoam itself and the fact that we think the moat will shrink over time because more and more insulation manufacturers rush in the market and try to move in the high priced area, where Sto mainly sells its products. Merry Christmas to all of those who celebrate! Disclaimer. I have made a small reading mistake, it is not the capital of Sto SE which is important for the calculation, it is the capital of the Sto Management GmbH. The capital of the Sto Management GmbH is actually around 1 Mio. Euro which leads to costs of only 40.000 Euro plus every expense of the GmbH which you cannot control, furthermore you cannot control if the Sto SE gives a loan to the GmbH which would increase their capital and leads to higher costs. The expense for their service is in my opinion tax deductible. I don’t know any other company which had mad a move like this in the last years, but it can be a problem for every other company which is mainly controlled by one family.